Ok, this will be my last Lloyd Kiva New post for a while. This one is about LIFE Magazine's article on Squaw dresses (left). Now, the thing about Squaw dresses is.. well, the word 'squaw' is used to describe it. 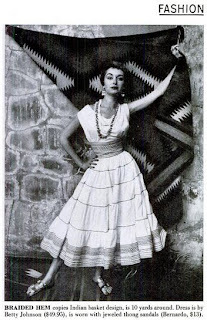 I've brought up this topic once before (click here to read the post) when I discussed a video that spotlights Southwest fashion and the Squaw dress in the 1950s. The video is rather interesting, so definitely check it out if you have a spare minute. 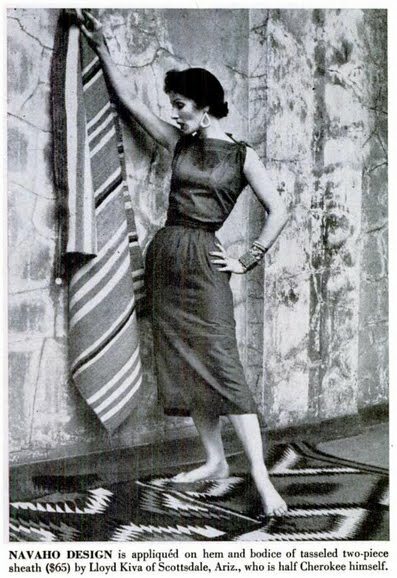 My dissertation advisor, Dr. Nancy J. Parezo, has conducted research on the Squaw dress, and you can read her article on this fashion phenomenon here. Essentially, she states that the Squaw dress was a categorization label for regional-style dresses in the American Southwest in the late 1940s. The dress later became a national trend in the 1950s. The popularity of this style was due in part to its comfort, but also because of the regional Indigenous associations and Native origins. This is one reason for the label: American designers, coming into their own in the post-war years, were determined to distinguish themselves from European designers. As Parezo explains, "What better way to do this than to use names associated with and design ideas borrowed from or inspired by the First Americans?" At any rate. 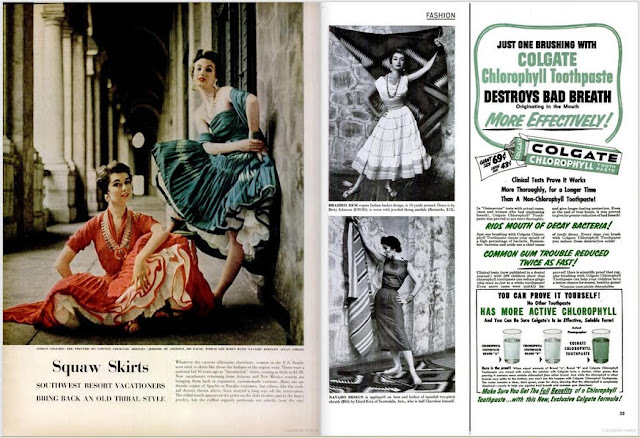 LIFE Magazine ran a 2-page article (well, a 1.5 page article) on 'Squaw Skirts' (in the pages right after Lucille Ball tells you to smoke a pack of Philip Morris cigarettes, ah yes the 1950s!). The fashion spread is pictured above. The article, which looks at how "Southwest resort vacationers bring back an old tribal style," features cotton Squaw dresses, made by designers from Arizona and New Mexico and accented with Navajo squash blossom necklaces, feminized bowguards, and Native-made silver bracelets and earrings. Pictured in the spread is Lloyd Kiva New's pricey sheath dress (a type of dress that fits close to the body, is relatively unadorned, and falls knee-length). His dress is described as having a simple 'Navaho design' appliqued onto the hem and bodice. New was known to work with many Native artists hailing from different tribes, and he had several Navajo friends and colleagues. Navajo artist Andrew Van Tsihnahjinnie was one such artist who assisted New in silkscreening unique Native designs onto fabrics for his fashion designs. So the fact that a Cherokee fashion designer had a 'Navaho design' on his dress is probably an indication of his collaboration with other Native artists. Interestingly, Lloyd Kiva New's dress (right) isn't made using the 'Squaw dress' style. Yet they include him. Go figure. Hmnnn---the style would be a hit possibly with male tanoura dancers in Egypt, male dancers in Bhutan, or male Indian Kathakali dancers, except that ethnic males with a tradition of wearing some type of skirt, and there are still many, are in the rut of it has to be exactly as handed down by their ancestors, and if it's different than that, it's probably "female." Without men riding horseback, people living in arctic areas, factory work, and certain physical activities, trousers might never have been invented. Certainly the Romans detested trousers and exiled men wearing them in AD393 as political subversives.